In Pain? Need Help? We’re Here For You! Dental emergencies come in all shapes and sizes, but they always have at least one thing in common: they are never, EVER planned! No one can anticipate a knocked out tooth or painful toothache ruining their day, but what you CAN do is have a plan should the unexpected ever happen to your smile. For the people of Tullahoma, that plan is simple: call Petty Dental. Dr. John Petty and our team have handled countless emergencies over the years, so no matter your situation, you can trust that we’ll be able to take care of you. We always try to see emergency patients the same day that they call in, so when you’re in pain, you can trust that we won’t leave you waiting. We’ll work as fast as we can to provide relief so you can get back to your life and start forgetting your dental emergency right away. If you are unsure whether or not your situation is a dental emergency, just give us a call, and we’ll be happy to let you know what you should do next. However, if you believe that you have suffered a broken bone, or if you cannot stop bleeding after 10 minutes, please head straight to your local emergency room first. Contact us only after you have been cleared to leave. 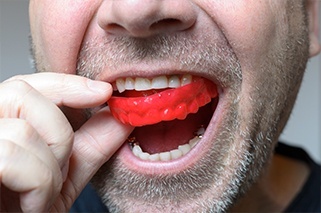 Wear a mouthguard whenever you play sports, no matter your age or level of play. Up to 40% of all sports injuries are actually dental injuries! Don’t chew on extremely hard things like ice, pens, pencils, rock candies, etc. Visit us for regular checkups and cleanings. Many dental emergencies are simply the product of a small problem being allowed to turn into a big one. Regular visits to Petty Dental will allow our team to catch and treat minor issues before they can become worse later on!